IBM Cognos is a well established BI platform, typically used in large organizations with extensive reporting needs. Its reach is broad, covering reporting, planning, forecasting, mobile, dashboards and data visualization. 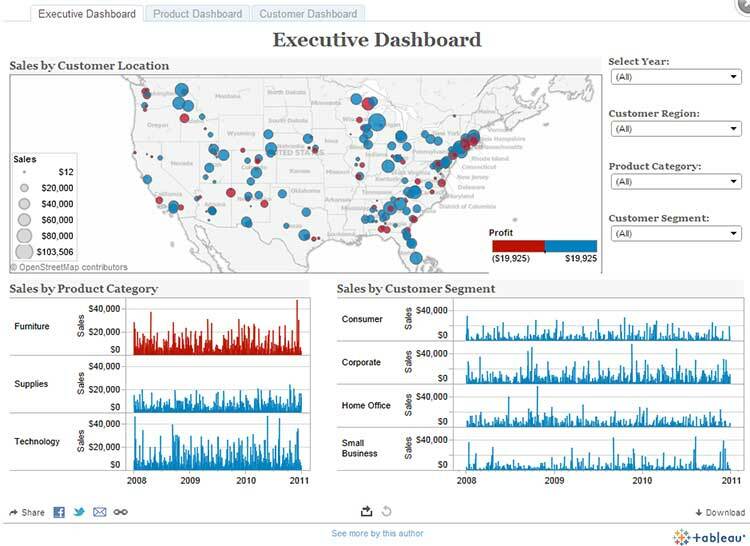 Tableau on the other hand is almost pure-play data visualization, with an interface to the R statistics language for more advanced analytics. These could be seen as complementary products, since the data visualization capabilities of Cognos are not as easy to use, and in some cases not as advanced, as those of Tableau. However for many business needs the data visualization capability provided by Cognos will be adequate. The other aspect worth considering is that IBM Cognos is one of several products provided by IBM that together provide a complete analytics platform. IBM SPSS is the statistics and predictive analytics platform, and IBM also provides business optimization capability in its ILOG products. They all work together and deliver quite a formidable analytics capability. Tableau on the other hand is really a stand-alone point solution to a very specific need – the exploration and visualization of data. IBM Cognos is a large, sprawling suite of products that will address every conceivable business intelligence requirement. Whether it does it with flair and efficiency is another matter. The platform will only be of interest to large corporations who have well established needs for production reporting, planning, budgeting, forecasting and what-if analysis. It does all these things very well, but the new age of self-service data visualization and exploration seems to be of secondary importance to Cognos. IBM’s leading data visualization technology tends to be associated with its big data products. This is not to say that Cognos does not address data visualization, but it’s definitely not as light on its feet as products such as Tableau and Qlik Sense. Of course a large part of the Cognos suite comes in the form of TM1 – the planning, forecasting and budgeting applications and tools. Again, a facility of this magnitude will only be of interest to the largest businesses, with a substantial OLAP engine at the heart of the product. Mobile support is good, with native applications for iPad, iPhone and Android devices. These provide a great deal of functionality, and are not just report and dashboard viewing apps. They work offline too if needed, with processing of local downloaded data sets. Cognos comes in three flavors. Cognos Insight is a desktop platform for individual use, and it can play its part as a workstation in a larger Cognos deployment. I cannot imagine that anyone would use Cognos Insight as a stand-alone tool outside Cognos Enterprise (although they probably do!). Cognos Express is positioned as a platform for departments and medium size businesses, and can be extended with various add-ons. Cognos Enterprise is the full deployment and comes with a sophisticated architecture. I have to admit that it is hard to get excited about IBM Cognos, with images of Victorian buildings full of accountants thumping away on calculators. Yes, it’s a little bit unfair to position it this way, but Cognos needs to reinvent itself if it is to appeal to the new mood for democratized, self-service business intelligence. If an organization is heavily invested in IBM technologies then Cognos is certainly one alternative. But there is a shift taking place in the way businesses use business intelligence technologies, and Cognos is lagging to some extent.